Today will see the running of the 164th University Boat Race. But there’s a little bit of Eglwyswrw hidden away in the Boat Race archives. In the 92nd edition in 1946 sitting in Seat 5 for the Light Blues of Cambridge was Geoffrey Cunningham Thomas of Jesus College. Geoffrey was born in Hirwaun, the son of Dr Benjamin Thomas and the grandson of the Surgeon Dr Ieuan George Thomas. His great-grandfather was Rev Benjamin Thomas, or ‘Myfyr Emlyn’ to go by his Bardic name who was born in the foothills of the Preselis in 1836 and who moved to Pantygarn in the village of Eglwyswrw in 1849 (his youngest sister Anna married Stephen Lewis of the neighbouring farm Carnhuan - they were my gg-grandparents). Young Geoffrey weighed in at 13st and 9lb - the heaviest of any of the participants in either boat on that day, 30th March 1946. It was reported that many in the Light Blues had taken unwell in the days leading up to the race which hampered preparations but the race went on. Sadly for Geoffrey and for the family honour, 1946 would be the only race in the first 6 post-war efforts that would see the Light Blues of Cambridge place 2nd! Geoffrey eventually emigrated and married in Rhodesia in 1970. He passed away on 9th September 1999 in Waterfall, KwaZulu-Natal in South Africa aged 73. To my knowledge he had no children and as an only child himself, his story will have been lost. But he isn’t forgotten and neither is the fact that on this University Boat Race day, thanks to my Mam’s 3rd cousin, there is a little corner of west Wales that will forever support the ‘Light Blues’. It's been 2 years since I wrote in this blog about my burgeoning family history research that had been kick-started by the support of Mick Cole in Barry. I honestly don't know where the time goes but it is now exactly 5 years since I finally decided to begin researching my family and it has been quite a ride. As I stated at the time here in my blog, it all began with my paternal grandfather William Benjamin Cole's birth certificate from April 1899. With the help of Mick and so many other family relations, that tentative start has grown into a monster. 5 years on, my paternal tree now includes over 8,700 names. It includes non-blood family from around our home stomping ground of Martletwy, Landshipping and Loveston where neighbouring family married into neighbouring family - as well as telling a personal family story, it tells a fascinating tale of a tight-knit community prior to the age of change in the face of greater transportation. My maternal family tree from up and around Eglwyswrw has in itself grown to over 8,100 in number with the same mix of blood relations going back generations, as well as the wider story of neighbouring families from around Brynberian, back to the village and into the hinterland around the Preseli Hills in all its fascinating complexity. So from one single birth certificate, a combined tree of over 16,800 names has resulted after 5 years of research. As that time has moved on, the number of new relations to contact and new discoveries to find has gradually slowed down as most bases have been covered. So it's amazing when a big breakthrough is made out of the blue. So it was only last week when I came across new photos of two of the greatest enigmas in my research. 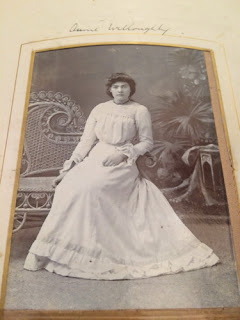 On my paternal side, thanks to my Dad's 2nd cousin Carole Thomas in Pembroke, a previously unseen photo album had come to light which included the image of my grandmother Maude Cole's first cousin Annie Willoughby. 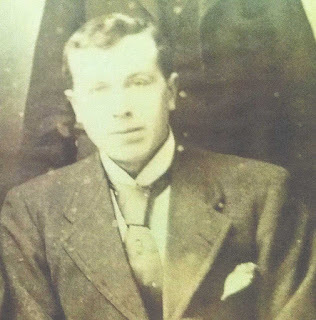 At the same time, my Mam's 2nd cousin Nia Roberts in Swansea had come up trumps with a first ever image of my great-grandfather Stephen Thomas Lewis' brother Griffith Alban Lewis. Both Annie and Griffith led what can only be said were colourful lives. It is said that every family has skeletons in the cupboard and these two, on either side of my family, certainly had their fill of skeletons. So to find within a matter of days of each other, an image of both, having long given up on the idea that such images existed, was quite something. It goes to show that the research never does end - even 5 years and nearly 17,000 names later. Never give in. Keep talking to family relatives. Keep asking for photos. Keep researching. It's incredible to think what information lies out there, undiscovered. Where it ends, who knows, but the last 5 years have been greatly fulfilling in terms of self-exploration. So for cousin Mick, who was with me for so many of those formative trips into our family past, it goes on. The song was famously sung by Andrea Bocelli who happened to be a favourite of my late father Lance and it's probably as apt a heading to a blog post as any for what in many ways is a bittersweet juncture in my life. Because after much reflection and deliberation, I decided some time ago that I would not be submitting my name for re-election to Ceredigion County Council and Cardigan Town Council in 2017. Back in 2014, I wrote this blog post on the 10th anniversary of my election to local government which explored those tentative early steps and my progress as a Councillor in Cardigan. As mentioned, there have been many highlights, be it at a town or ward level. But as I stated then, it's those personal stories of support that never make the papers that will live with me. That 6 or so year involvement with a local resident and her housing traumas which finally materialised in her finding a new home just outside of town. She's now studying as a mature student and I'm very proud of her for moving forwards with her life despite the many knocks on the way. Then there was the call from a desolate local resident who had suffered years of domestic abuse who found out, on his finally leaving the family home, that he had left in his wake, countless unpaid bills. This resulted in a Council Tax demand and the threat of a visit from bailiffs within the week to recoup the amount owed in furniture and fittings. I spent 4 hours of a Sunday evening listening to the horror story unfold in her front room. The fact that she technically lived the wrong side of the road from my ward did not matter. She had come to me and I had to help her. I vividly recall going to sleep that night feeling the weight of the world on my shoulders as I had never felt before. Here was a truly horrific case, the like of which I had never faced to that day or since. The next morning I called a senior officer in the Council's finance department in Aberystwyth and asked for the bailiffs to be called off and to agree a regular pay-back plan with her. With letters of support from the local Women's Aid, local chapels and the local food bank, this was thankfully achieved. Finally, my final major piece of casework was thankfully resolved positively only last week when a year long support for two local residents finally saw them move into the home they had first been promised by Tai Ceredigion some 18 months earlier. These are only the tip of the ice-berg and I can look back at countless cases of support offered or guidance given in the hope that my presence and involvement has brought about a positive end result or at the very least, given moral encouragement to the one in distress in the knowledge that they are not alone. Over the past year however, I have felt an increasing need to press 'pause' on this life of service. Elected aged 21, I have effectively spent my entire adult life in the service of others. Whilst I have enjoyed the challenge and the opportunity to make a positive difference in people's lives in that time, I have now reached the point where I need to take a step back, reflect and gather breath. That doesn't mean that I'm suddenly going to disappear off the face of the planet! I'm looking forward to continuing in an active role in the community life of our town but with the time to concentrate on a few specific interests of mine. "I now want more time to devote to politics and more freedom to do so". I can understand fully his feelings when he wrote that comment. I want to devote more time to politics and to support those who wish to contribute in their own way to civic life. I specifically would like to see myself in a supporting role, supporting others who wish to do what I have done. I would like to use my experience to bring forward and support new and exciting candidates who wish to support the liberal cause by being community champions in their own right. In this light, I'm delighted that in my wake, I'll be supporting excellent new candidates in Cardigan this spring. Elaine Evans is standing to replace me in Rhyd-Y-Fuwch ward and having started the 1,000 strong online petition to save Cardigan Library in its old location and with her passion for the town of her birth, she will be a great voice for her community. Likewise, Sian Maehrlein in Mwldan ward is another well known Cardigan character who wants to support her home community and will be a strong and confident voice for residents in the Council Chamber. Steve Greenhalgh meanwhile will continue as he did in 2012 by speaking up for residents in Teifi Ward with that cheeky smile and commitment to social justice and fairness that is the embodiment of his character. They will be joined by Yve O'Neill and Marilyn Farmer on the liberal campaign trail - two more women with firm opinions and a resolve to help those in need in our town. So the liberal fight in Cardigan goes on and indeed, with 5 out of 6 of our candidates being female, we are also striking a positive blow for better representation in local government. All of this has sought to confirm my view as to the future. If nothing else, I've always prided myself on having a good sense of perspective and that, along with a keen self-awareness, has led me to realise that if I feel that I need a break to re-charge my batteries as is the case, then it is certainly best to stand back and to allow these new and keen candidates to come forward to take my place. "The Presidential office takes a heavy toll of those who occupy it and those who are dear to them. While we should not refuse to spend and be spent in the service of our country, it is hazardous to attempt what we feel is beyond our strength to accomplish". Ceredigion County Council is not the United States of America and its HQ at Penmorfa, Aberaeron is certainly not the White House! But when I read these words whilst reading up on the American Presidents during my last trip to America back in the autumn, the words struck home. The opportunity to re-charge the batteries may give me renewed energy in due course to stand for elected office once more in the future or the freedom from the responsibilities that come with the role may become a newly found friend that I may not wish to relinquish. I do not know. The future is just that. It is an untold story that has yet to be written. But for now, in the present, I feel that having spent virtually my entire adult life in the service of others, like Coolidge, I sense that now is the time to reflect and accept that the tank is empty and that I feel as if I have given everything that I have to give in elected office. So it's time to say adieu and I know I'm going to miss it. Terribly. The ability to help others is something that no money can buy. The change that can be positively made from local government, even in times of tighter budgets, can never be underestimated. For those who wish to do good, being elected as a Councillor gives a fantastic opportunity to do so and to put back into the community. But then, help and support can take many forms and I will seek to continue to do my bit for my community, just from a different angle. Dare I say it, but from a different 'perspective'. So this isn't the end. It's merely the completion of one chapter and the beginning of another. The last 13 years have been a roller-coaster ride and if I had my time, would I ride it again? You bloody bet I would! So it has been a historic day. The 13th March 2017. The day everything changed. Forever. The day when the House of Lords caved in and allowed Theresa May to trigger Article 50 within days and also the day when Nicola Sturgeon called for a 2nd Scottish independence referendum within 24 months. Of course, the two are inextricably linked. Had England and Wales not voted for Brexit in as much number as they did to overturn the Remain majority in Scotland and Northern Ireland, Sturgeon wouldn't have been handed the 'game-changer' that gave her the moral right to call a 2nd referendum so soon after the first. I have to say it, she's right to do so. So Theresa May and those who wanted 'their country back' will get it. That country however won't be 'Great Britain', it will be 'Little England with Wales on the side'. Good luck to Scotland as it moves inexorably towards independence. As for Northern Ireland? 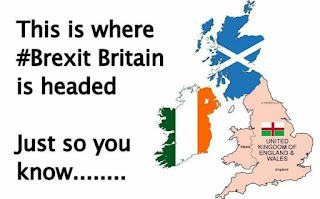 I think it's time that they seriously look to unite with our fellow Celtic cousins south of the border - as difficult as that will understandably be for so many in the communities of the north. So yes, 13th March 2017 is a historic day. I don't say this with any pleasure. As a Federalist, I have believed in the strength of the Union of nations that has made up the United Kingdom. But the loss of our place at the heart of the European Union, for those of us who are internationalist to our bones, is a monumental blow. 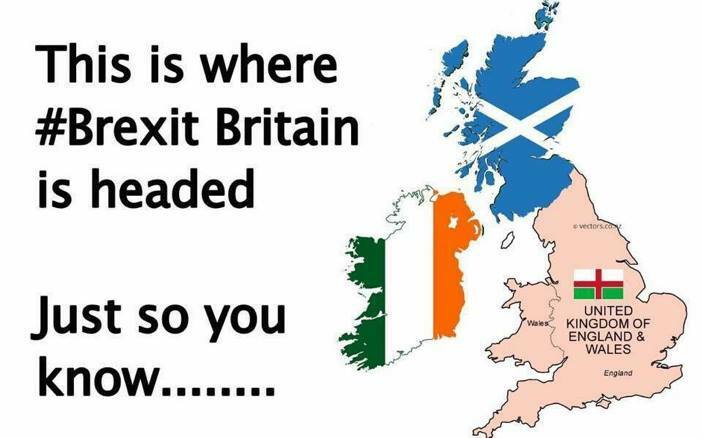 For those who live in Northern Ireland and Scotland who will see their country ripped out of the EU against the collective will of their own nations, it is a critical moment from which there is no turning back. As I say, it is with great sorrow that I accept that these coming truths to be self-evident. I do so as a historian, with an eye to the past as a lesson for the future. Many who voted for Brexit will not have realised the consequences of their actions. They will not have voted Brexit because they wanted to see the break-up of the Union. But their decision will result directly in that final destruction of the Union as we know it today and have known it for the past century. To not accept this fact is to be wholly condescending to the individual cultural and national identities that make up the Union. It is also to be deluded. The decision made on the 23rd June 2016 changed everything. But dependant on the Government's precise response to that narrow 'Leave' victory, the Union could've been salvaged. But by pursuing a 'Harsh Brexit' that will see us leave the single market, a Tory Government, that bastion of Unionist sentiment, has set in train a domino-effect that has gathered momentum to destroy all that it cherishes. It if wasn't so sad, it would be amusing. Efforts to put a brake on the process by at least giving the people who voted for the departure to have the final say on the destination once the full picture is known, failed today in Parliament. So Theresa May will now invoke Article 50 and Scotland will seek to wriggle out of the ensuing mess that will follow. So yes, 13th March 2017 is a historic day. It's the day that marks the beginning of the end of the United Kingdom of Great Britain and Northern Ireland. May the last one to leave the UK, please turn out the lights. Over four years of family history research has re-enforced to me how we are all one global, single community. It's incredible when you scratch under the surface just a small amount, to find so many long-lost, far-flung connections around the world all with roots back to the same place. I've been very lucky in my research in that I am based in Pembrokeshire where I can trace both my immediate paternal and maternal lines all the way back to the late 1700s at the very least. Mine is a very 'Pembrokeshire' family on all sides with all 4 grandparents, all 8 great-grandparents and 14 of 16 great-great-grandparents buried in the county. The only missing pair are Thomas and Jane Davies who are buried in Treorchy Cemetery - I'm fortunate that their daughter Elizabeth decided to move back from the rush to coal in the valleys back to her homeland where she married David Cole. Had she not, I wouldn't be here today telling their story! Going back another generation and again, all of those 32 ggg-grandparents that I have found are buried in Pembrokeshire apart from 1 ggg-grandfather who is buried in Glyncorrwg high up above Maesteg. A handful of lines can be taken back centuries earlier on the back of old research carried out over many years by others and which is well documented. The Pictons of Pembrokeshire is a classic example. The current crop of researchers in many ways are standing upon the shoulders of the giants who went before and have given us so much information to work with. Our job is to add to that store of information for future generations. There is a significant family presence in Australia from various lines going back generations and links also to South Africa. There is still the much vaunted but unsubstantiated links to Patagonia in the middle of the 19th century. That is one 'lost-line' of my gg-grandfather's siblings from Brynberian that I would dearly like to discover. Or did these 'black sheep' of the family not go to Patagonia after all but to North America? I don't know, but if they did, they were in a long line of family lines that crossed the pond looking for a better life. Many emigrated to find better employment in the burgeoning American coalmines after the coal industry in Pembrokeshire began to grind to a halt at the same time as the boom in the south Wales valleys. But whether it was the coal of other issues that brought movement, move they did and over 4 years I have found a wealth of lines living throughout that great nation. With my global membership of Ancestry.co.uk I've been able to track down a lot information on these various lines and having vaguely made an effort at keeping all of this information in order, decided to put together a map to visualise that movement. It was greatly revealing. 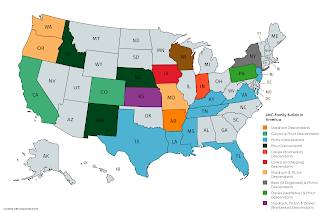 This map shows that from my research to date, I am confident that I have tracked down blood relatives who lived and died in at least 23 of the 50 states. The biggest concentration focus on Kansas in the heart of America where at least 3 distinctly separate lines in my heritage converged. The same could be said for New York and Pennsylvania states. Though of all of my lines, it is the very well researched Picton line of my gggg-grandmother Elizabeth mentioned earlier in this post which has spread across great swathes of that enormous land mass. But of course it's easy for it to have done so because we know so much about this particular family. What if as much was known about all the other lines in my family story? If only! No doubt that map would almost be full! But then that's the frustration and in equal measure, great joy of family research - it never ends! As one door closes, so many more open. It is a never ending story. So I shall continue to uncover that story. There is so much more to be told.